Happy Halloween all! 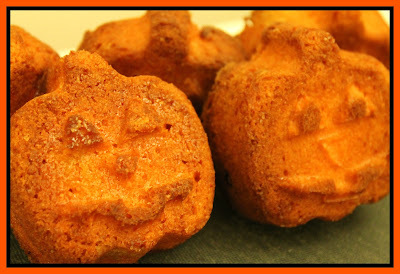 In the spirit of Halloween, last night I rustled up these really quick and easy 'Pumpkin' head cakes. I picked up the mould for these in Aldi last week for under €3.....bargain. These cakes are really sweet and moist and are perfect for handing out to 'treat or treaters' and family alike. 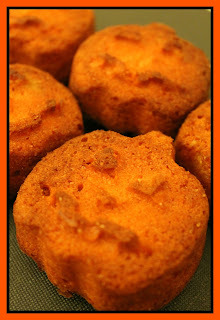 I used food colouring to achieve the bright pumpkin orange colour. Happy baking! Not to worry if you don't have a Pumpkin Mould.....without the mould, you can still make fantastic orange coloured cakes using a regular cupcake mould and add some black butter-cream frosting for dramatic effect! 1. Preheat over to 170°C. Grease your cupcake cases or tins. 2. Put the butter, sugar, eggs, and syrup in a large mixer and combine well until smooth. colouring of your choice. I picked orange for these pumpkins. and mouth to make the details really pop. mixture can be used year round for all different types occasions. Those look fab. I reall want the mould!! 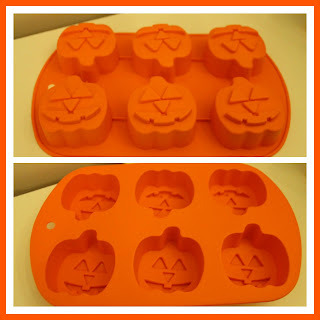 Got new cookie cutters in Aldi last week, pity I missed the pumpkin moulds! P.S. Your blog is awesome. I looked at your profile first and I was like "whoa it's my double! I love baking, blogging, crafting and card making too!"